Loughborough University is delighted to announce that Sir Nigel Rudd, DL, has been appointed as the University’s fifth Chancellor. Sir Nigel succeeds Sir John Jennings, a former Chairman of the Shell Transport and Trading Company plc, who retires from the role after seven years. The Chancellor is the Chief Ambassador of the University and presides over ceremonial functions including acting as Chairman of University Court. The Chancellor also confers degrees on graduates of the University. Born in 1946, Sir Nigel was educated at Bemrose Grammar School in Derby. Leaving school at 16 he went into accountancy, and five years later qualified as Britain’s youngest chartered accountant. His future lay in the world of business, however, and in 1982 he founded Williams Holdings plc, where he was Chairman until 2000, establishing it as one of the largest industrial holding companies in the UK. He was knighted in 1996 for services to the manufacturing industry. Sir Nigel has gone on to enjoy great success at Board level with many well known UK companies. He has been Chairman of East Midlands Electricity, Kidde, Pilkington and Alliance Boots, and Deputy Chairman of Barclays. He is currently a non-executive Director of BAE Systems and Sappi, and Chairman of Pendragon and BAA, one of the UK’s leading airport operators. In 1998 his achievements were recognised with an Honorary Doctor of Technology from Loughborough University and an Honorary Doctor of the University from Derby University. He is a Deputy Lieutenant of Derbyshire and a Freeman of the City of London. Sir Nigel and his wife, Lesley, have three children and five grandchildren. 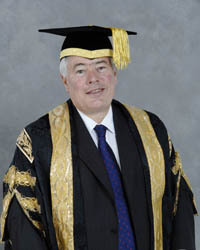 Sir Nigel was installed as Chancellor of the University on 15 July 2010. A photograph of Sir Nigel Rudd is available from the Public Relations Office, T: 01509 222224.